Now in year five, MADE Hoops 'The Warmup' continues to gain strength with each year that goes by. With over 130 teams, featuring elite programs and prospects from across the Southeast & Midwest regions, there's no denying that this event continues to gain stream with each year, and looks to become even stronger in 2020 and beyond. 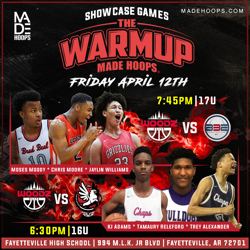 Look for the opening games of #TheWarmup to set fireworks off early on in the event, with two excellent matchups setting the tone Friday night with no shortage of firepower. The National Media Presence Will Be HEAVY! The media contingent in Arkansas will be very impressive, with a plethora of outlets setting their sights on #TheWarmup. The list includes: Nike, ESPN, SLAM, 247 Sports, Rivals, Ballislife, BallerTV, Bleacher Report, Overtime, HoopFocus, MSHTV, Mars Reel, Primetime Hoops, Jay Doe Films, The Connect Media, Visions By Jeff, and more! With stars such as RJ Hampton, N'Faly Dante, Cam'Ron Fletcher & Bronny James set to play this weekend, the most impressive aspect of #TheWarmup will be the depth of talent and rising stars who will ALSO be participating. So who will steal the show? Stay tuned to @madehoops on Twitter & Instagram throughout the event, as well as each of the other media outlets in attendance. And remember to use #TheWarmup hashtag!